Utterly unbelievable. I’ve been covering the Texas barbecue scene since the early 90s and this is the biggest story to break out of the world of Texas smoked meat in eons. John Lewis, former pit boss at Franklin Barbecue has joined forces with John Mueller. 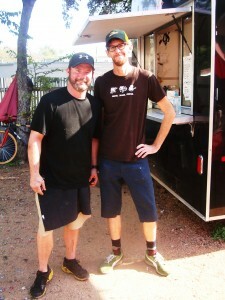 Can a humble food trailer contain the level of talent that these 2 men possess? These next few months will be interesting to say the least as Lewis begins his apprenticeship under Mueller. This entry was posted in Texas Barbecue, Texas Barbecue Photos and tagged austin texas, barbecue, john lewis, john mueller, texas. Bookmark the permalink.